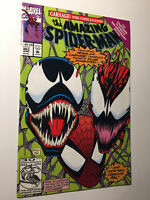 The Amazing Spider-man #363 NM (White Pages) Venom/Carnage App!! Amazing Spider-Man Annual #4 CGC 6.5 Human Torch 3rd Mysterio Appear SILVER AGE! Amazing SPIDER-MAN ANNUAL #13 #14 #15...ALL HIGH GRADE SEE SCANS. LOT!